Our network is operated on Fibre backhaul and delivered last mile wireless. This enables us to provide fibre quality connectivity to residential as well as SME and Corporate clients. Services are available as asymmetric or full symmetric. We make use of two upstream service providers to ensure network fail-over should an upstream provider have connectivity issues. We have a full complement of trained technicians to provide network support to our clients. 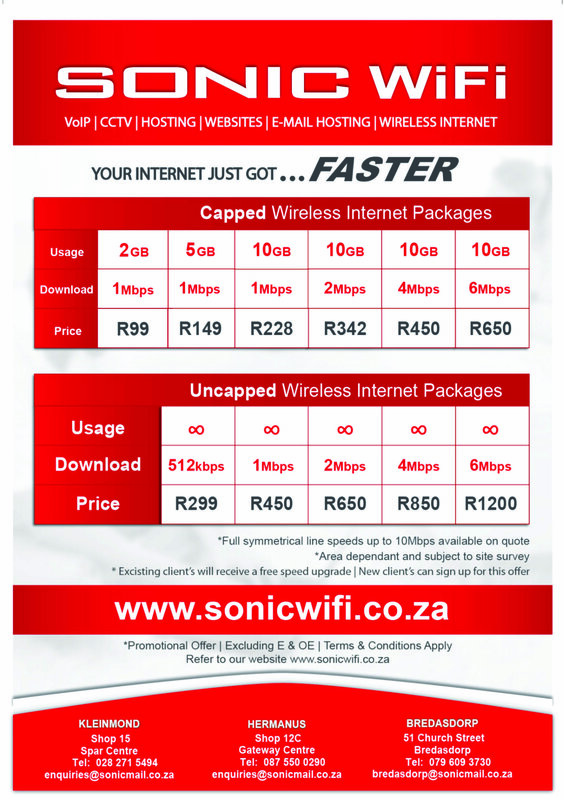 Sonic Wi-Fi is the preferred provider for more than 1000 clients in the Overstrand area. Our client base incorporates a wide spectrum of connectivity requirements, starting from the average home user up to the corporate user. We do offer a variety of products but all these services are related to the same core requirement – communication. With the expertise of the team, the network structure in place and the right products available we are confident that we can plan and implement the required ICT solution for all customers, no matter how big or small. Couple that with our reputation for service excellence, we always aim to be a step ahead and build lasting relationships with our clients. We make use of the unlicensed 5.8Ghz frequency for our client connectivity. We prefer Ubiquiti antennas for connecting our clients to our reception towers and make use of Mikrotik routers for internal management of devices and Wi-Fi capability.